Wonder Woman? No, Wonder Girl! The bishoujo-style statue is based on her appearance in DC Comics. Wonder Girl looks terrific in her classic outfit with her lasso at the ready! She stands approximately 8 3/4-inches tall in 1:7 scale. 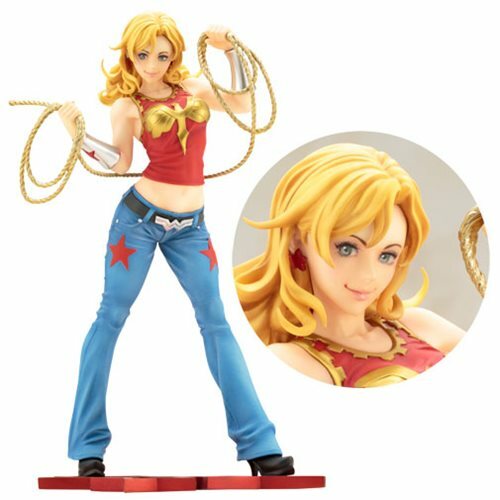 Wonder Girl joins Kotobukiya's bishoujo lineup of superheroes and villains based on characters appearing in DC Comics! She looks terrific in her classic outfit - a strap shirt with her symbol and starred blue jeans fastened with a buckle shaped like her logo - as she holds her lasso at the ready. The DC Comics Wonder Girl Bishoujo Statue stands approximately 8 3/4-inches tall in 1:7 scale on a special themed base. Ages 14 and up.